The Nintendo DS is on its way to becoming more of an educational tool than a gaming handheld, starting with the fast food industry. Hot on the heels of the news that Nintendo's Shigeru Miyamoto wants the DS to be widely used in schools, Nikkei is reporting that McDonalds will be using the Nintendo DS to train its employees as well. 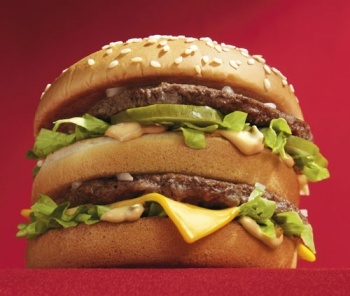 McDonalds plans to put an average of two DSs in all 3,700 of its restaurants located in Japan later this year. The McDonalds training program being developed for the DS is called "eSmart," which is suitably boring as I'm sure nobody wants it to be conceived as a game. Frying french and making Quarter Pounders is something that must be taken very seriously. eSmart will cost McDonalds around $2 million to implement. Unfortunately, there is no information on exactly how the training software will work. I'm imagining that McDonalds is simply repurposing Cooking Mama and adding its logo. Because so many people in Japan are familiar with the Nintendo DS system, McDonalds believes that eSmart will cut training time in half and make it more appealing. Ideally, it'll be easy to exchange the cartridge in the DS training systems so employees can play Dragon Quest IX while pretending they're learning how to properly assemble a Big Mac. eSmart could have unforeseen consequences on the productivity of Japanese McDonald's workers if so, but at least it would make working at McDonald's a little bit more fun.